There are days when I don’t feel up to cooking a meal from scratch. When it’s been a long day, everyone’s hungry and I need something filling and tasty that we all enjoy. It was one of those days when I popped into a branch of Waitrose on the way home, searching for inspiration. 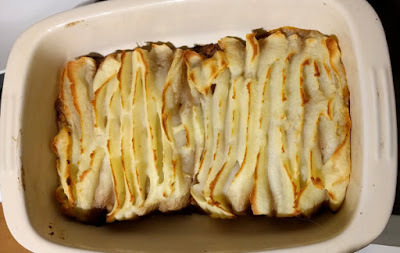 With the enormous choice of meals available these days, it can be overwhelming and I ended up going back to a trusted favourite, cottage pie. In the past I’ve bought a delicious cottage pie by Quorn. Unfortunately, although there was a wide variety of Quorn products, no cottage pie was in stock. The only other cottage pie I could find had red traffic lights virtually across the board – high fat, high saturated fat and high salt. 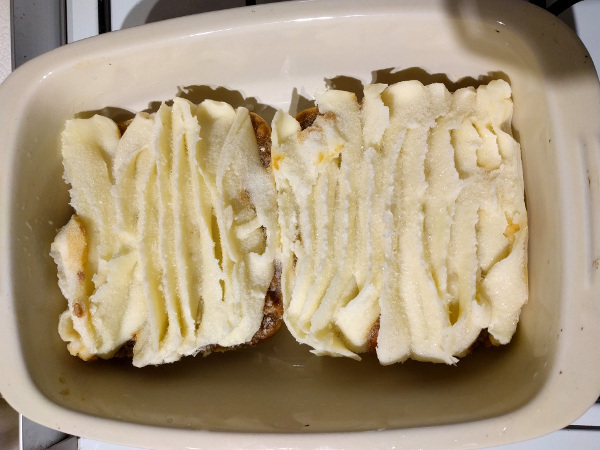 Running out of options, I headed over to the freezer and spotted a vegetarian Cottage pie with a welcoming green traffic light for fat, saturated fat and sugar. I didn’t hesitate to swap out the meat version for the vegetarian option. The whole 380g pack has only 317 calories so I decided to buy 2 packs as it would be shared between four of us. It has to be cooked straight from the freezer and the instructions advise to peel off the plastic film and cook in the tray. However, I refuse to cook anything in plastic (due to possible chemical leakage) and removed the frozen pies and put them into my own oven dishes. I insist on lots of fresh vegetables with every meal, which takes a little time, but still less than preparing the whole cottage pie from scratch as well. The soya pieces are quite chewy and there was a decent amount of gravy to provide a bit of sauce for the veggies. I don’t normally have much potato but the little I did have was creamy with a nice potato taste. Unfortunately I found the overall flavour of the soya and gravy part much too peppery for my taste. It ended up overpowering the whole dish and I did wonder whether it was there to mask the soy taste! My husband agreed it was too peppery. My youngest didn’t like it at all, and my other child said it was OK but not her favourite. The ingredients are reasonably good. There aren’t any nasties or anything weird sounding apart from wheat dextrose monohydrate which is a type of sweetener but can be used as a preservative. Salt isn’t high, and is only just over the green traffic light threshold and into the amber medium level. Available in Waitrose and Ocado online. Nutrition per 100ml: 84 Calories (317 calories per 380g pack), 2.6g fat, 1.1g saturated fat, 10.8g carbs, 2.1g sugars, 2.0g fibre, 3.2g protein, 0.35g salt. Vegetarian. Potato, water, onion, soya protein (6%), carrot, butter (milk), swede, rapeseed oil, tomato purée, cornflour, carrot concentrate, onion concentrate, salt, red wine vinegar, yeast extract, barley malt extract, pectin, rosemary, leek concentrate, onion powder, unsalted butter (milk), FORTIFIED WHEAT FLOUR (wheat flour, calcium carbonate, iron, niacin, thiamin), spirit vinegar, black pepper, thyme, wheat dextrose monohydrate, white pepper, sugar, flavouring, garlic powder, tamarind extract, ginger, lemon juice from concentrate.